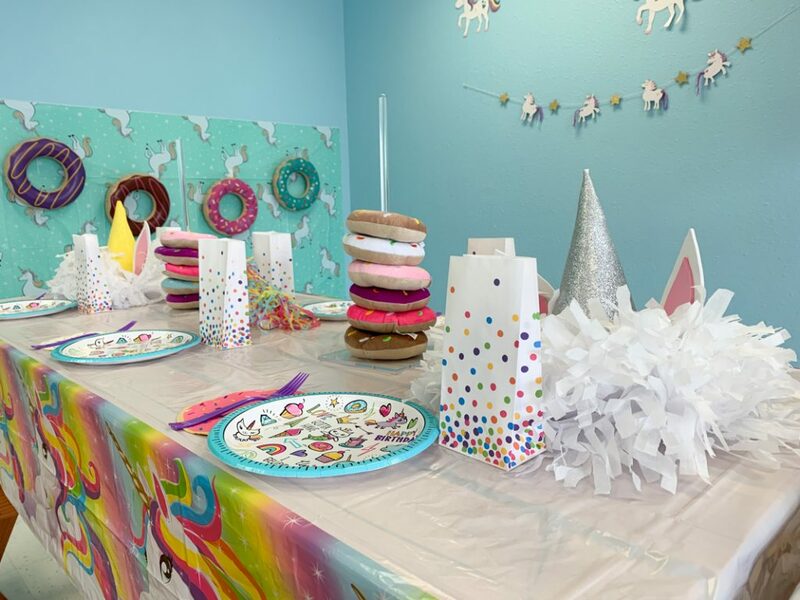 Unicorn parties are the big hitter here at Imagine Play, but we love it when parents bring us a twist like this unicorn donut party. We did our usual unicorn party flare, but added some sprinkles. 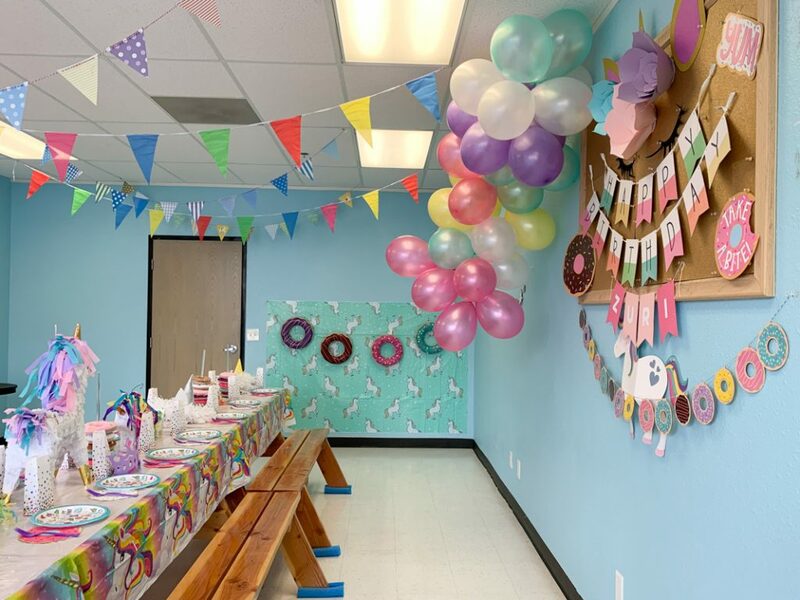 This themed party included our signature galloon garland with added shimmer. We pinned some extra donuts around our unicorn birthday sign. We also added a donut garland. 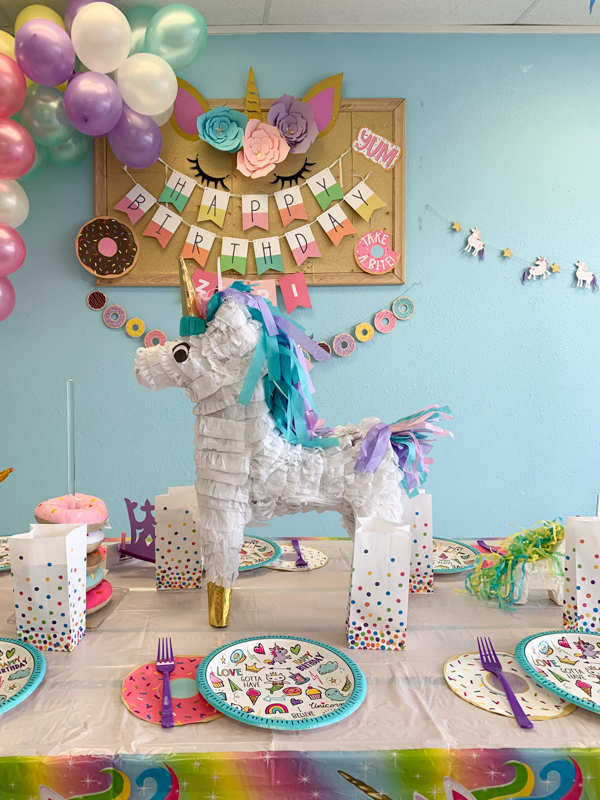 Table decor included unicorn pinatas, donut napkins and the perfect plate with the combination of the two together. We also love these clear stands with plush donuts. The colorful polka-dot bags reminds us of sprinkles. Perfect for our donut party. 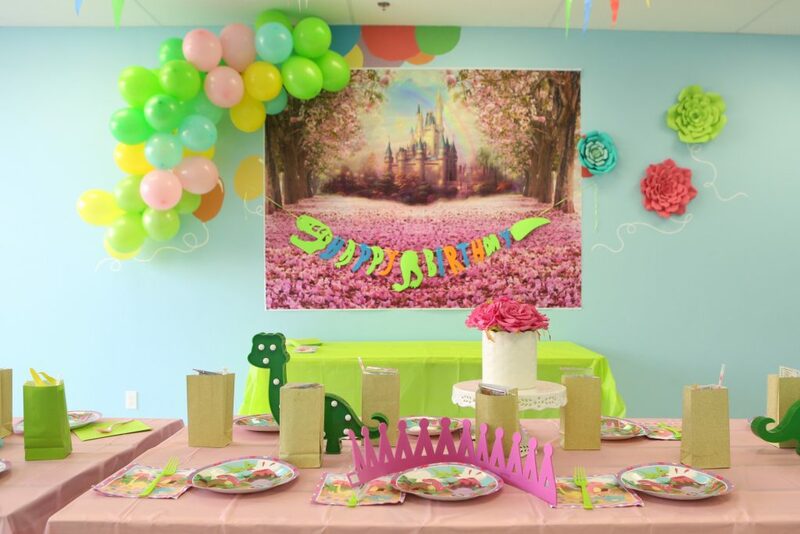 All our themed parties come with a photo backdrop. We love this unicorn one with inflatable donuts. 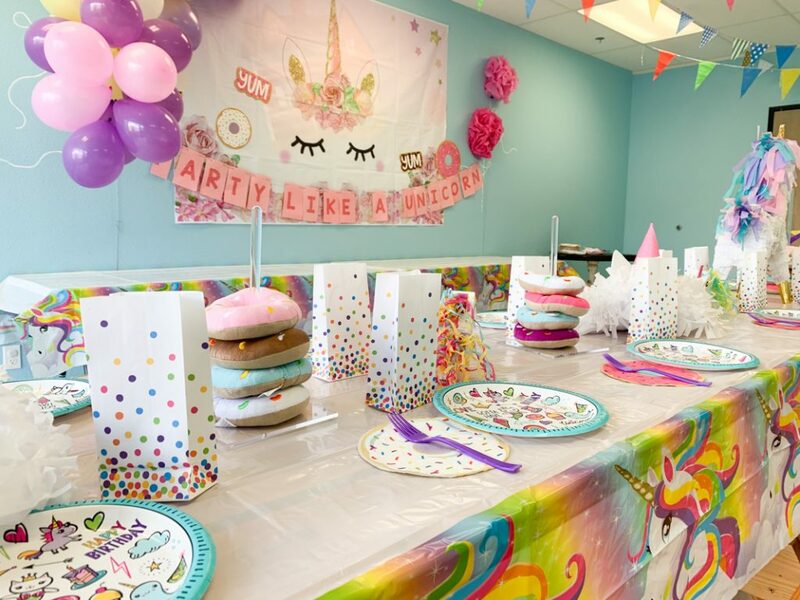 Check our our party packages to book your stress-free unicorn or donut party today. 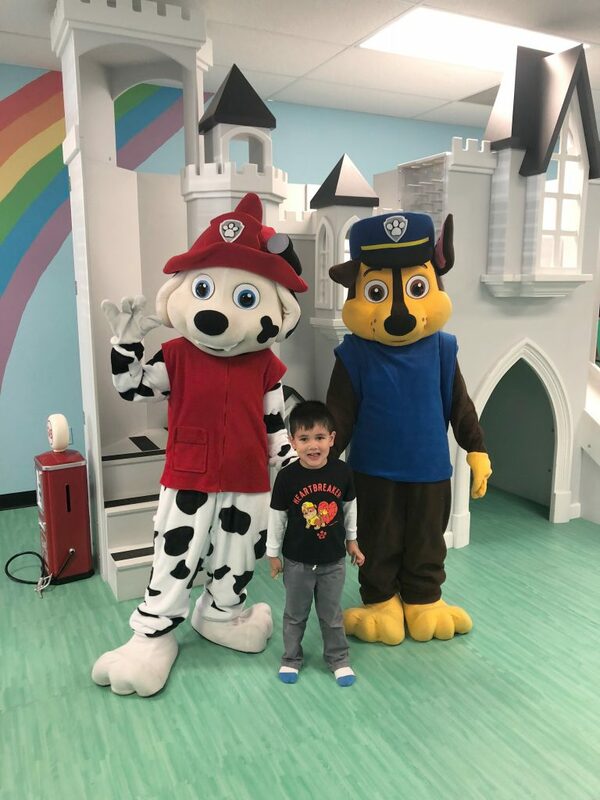 Does your kiddo love these crime fighting pups? 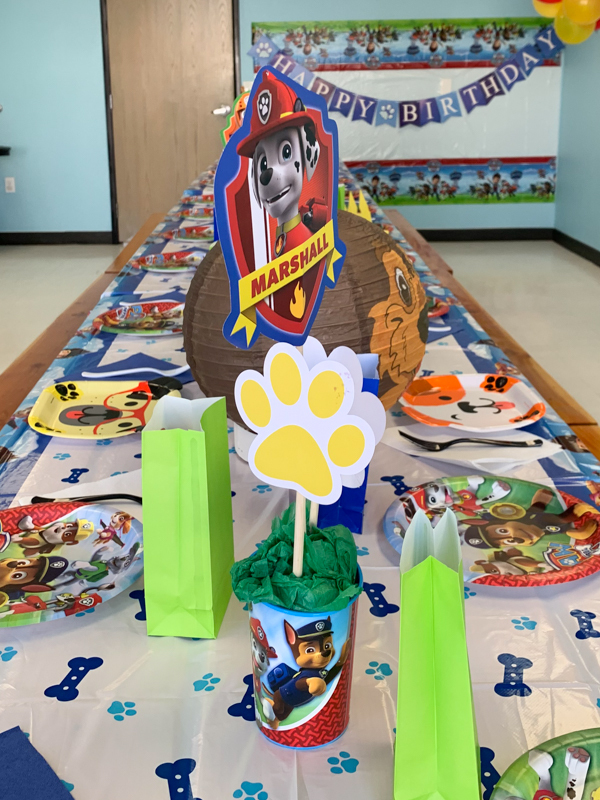 We know it and we can help save the day by decorating a Paw Patrol Birthday Party for you. 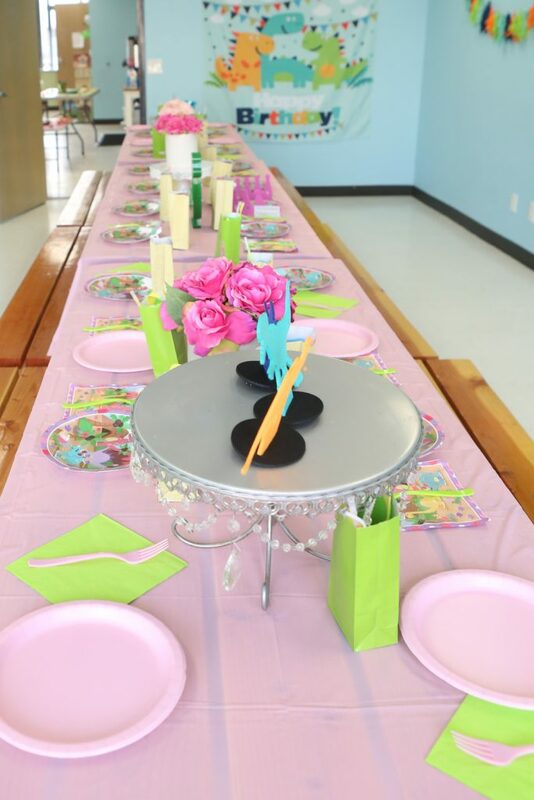 Our themed birthday party package always comes with themed table coverings and place settings. 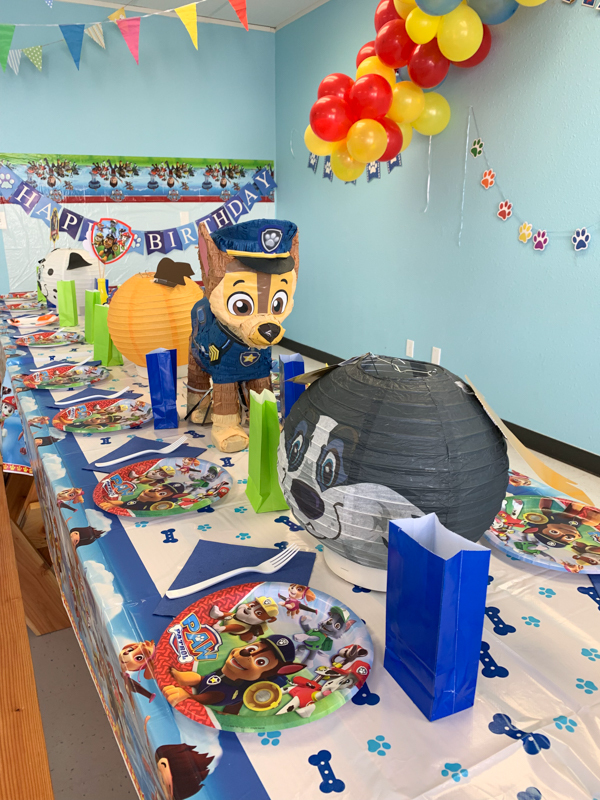 We really love this life size police dog as the centerpiece and we included some puppy themed lanterns for table flare. Of course there was also more paw patrol inspired elements. 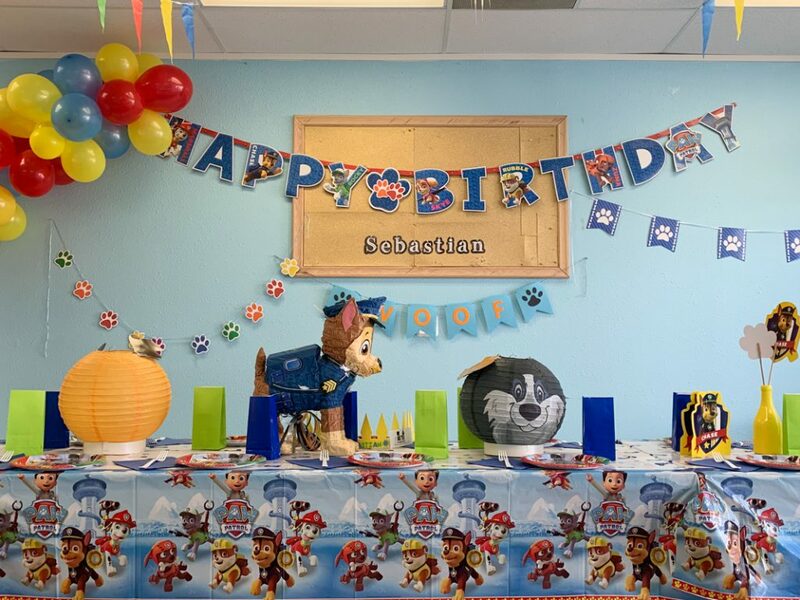 This paw patrol birthday party included a paw print backdrop, complimented by a blue and red balloon garland. 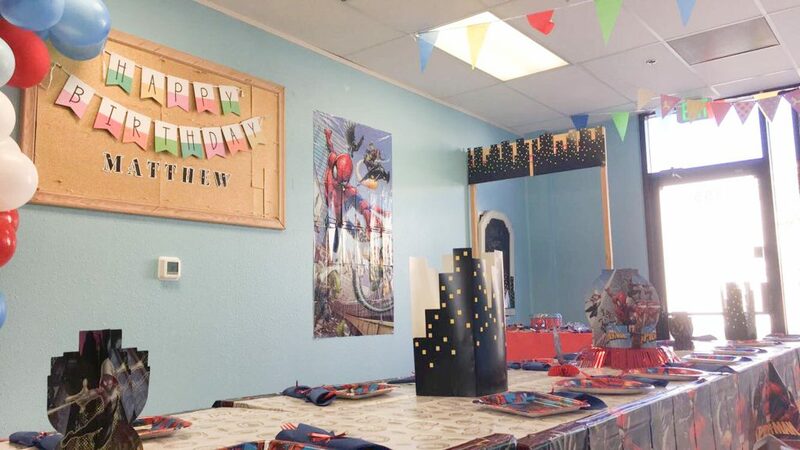 A themed birthday banner and garland completed the other side of the room. What a woof of a party! Aloha! 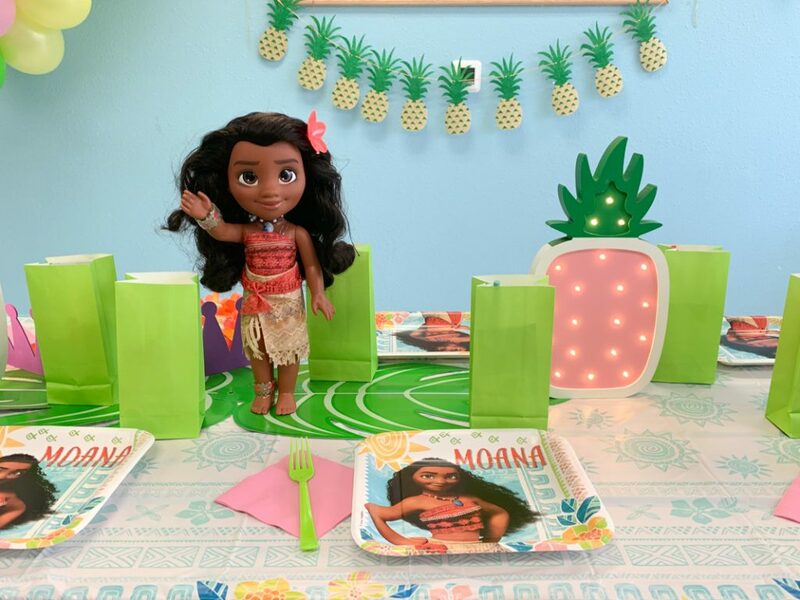 We haven’t done a Hawaiian Princess theme in a while and we’re so happy to share this party with you. All the bright colors reminds us of summer. 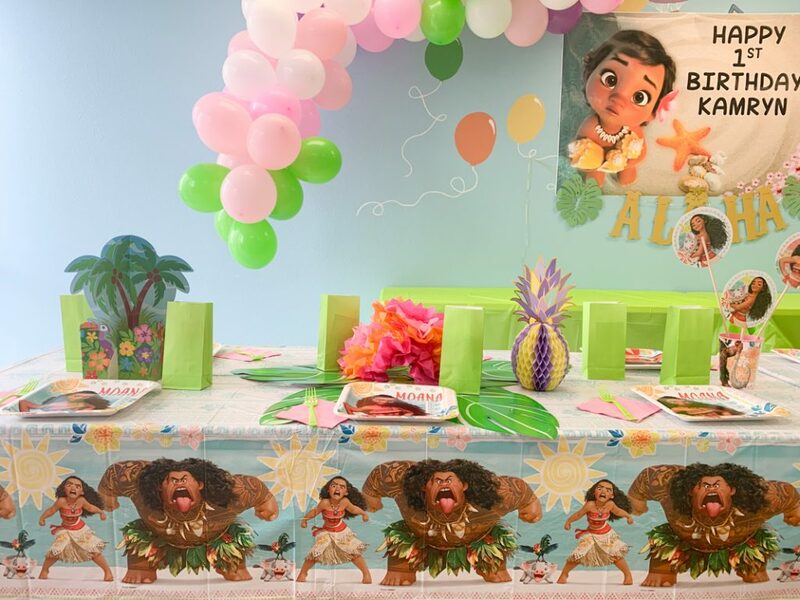 Check out all this cute decor for our Moana Birthday Party. 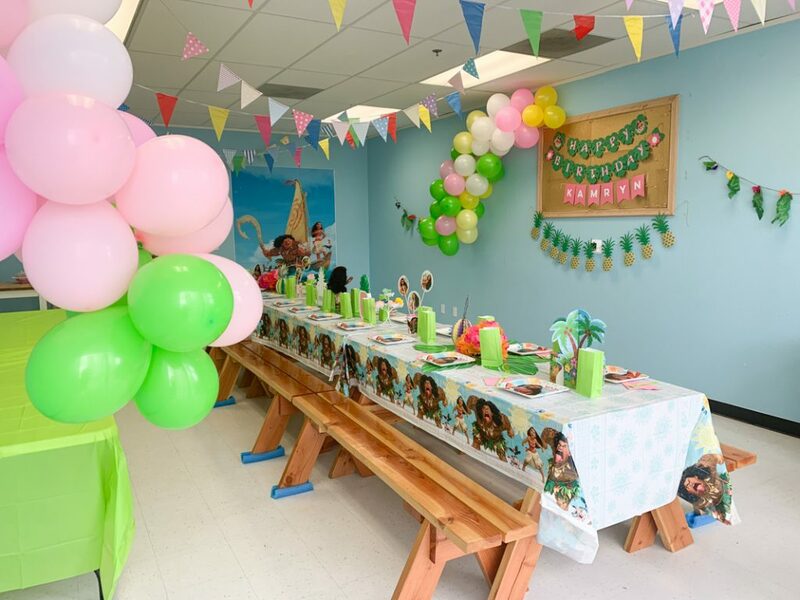 In our signature themed parties we adorn both of our walls with balloon garlands matching the colors of the theme. This party in particular had green, pink and yellow arches. 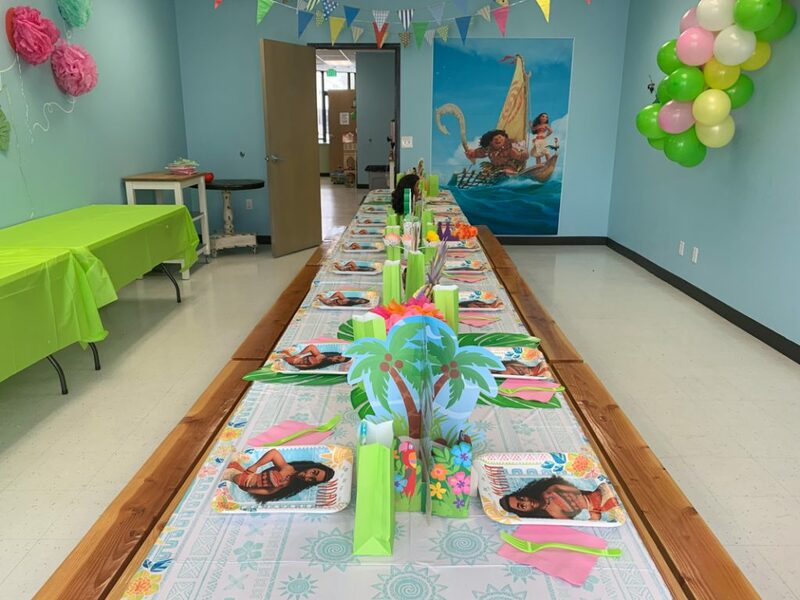 We love this customized banner the birthday parent’s provided for us for their little Hawaiian princess. 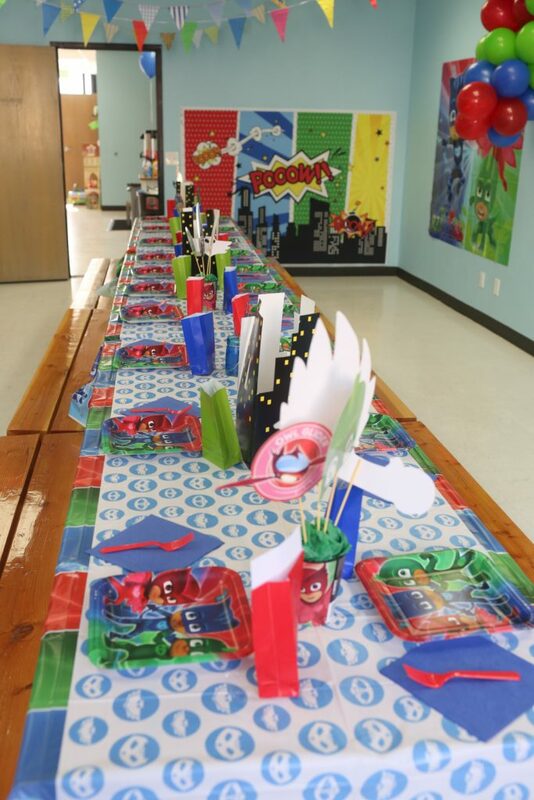 Our themed parties always include themed table coverings and a settings for each child attending. It makes the party complete. Table Decor include tropical pom pom flowers, palm trees, and pineapples. Our favorite is this centerpiece with our doll and marquee pineapple! 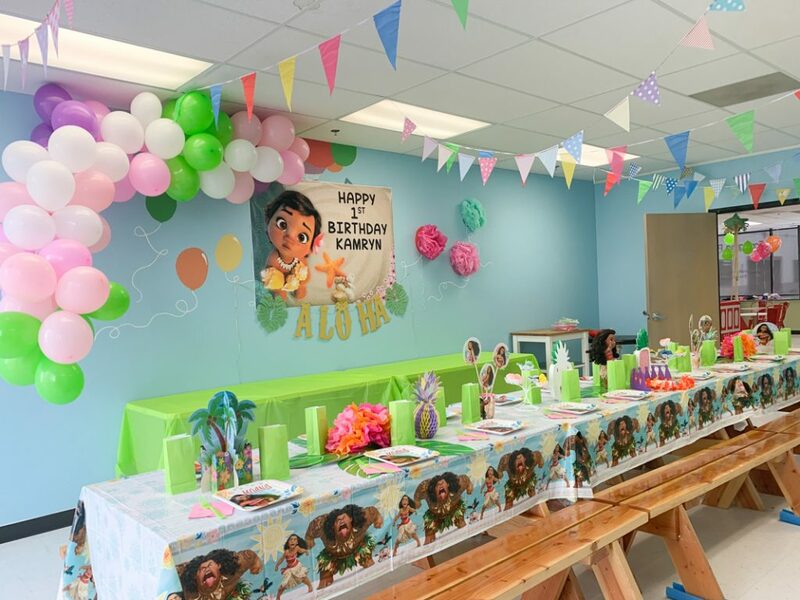 Let us decorate a Moana birthday party for you, contact us. 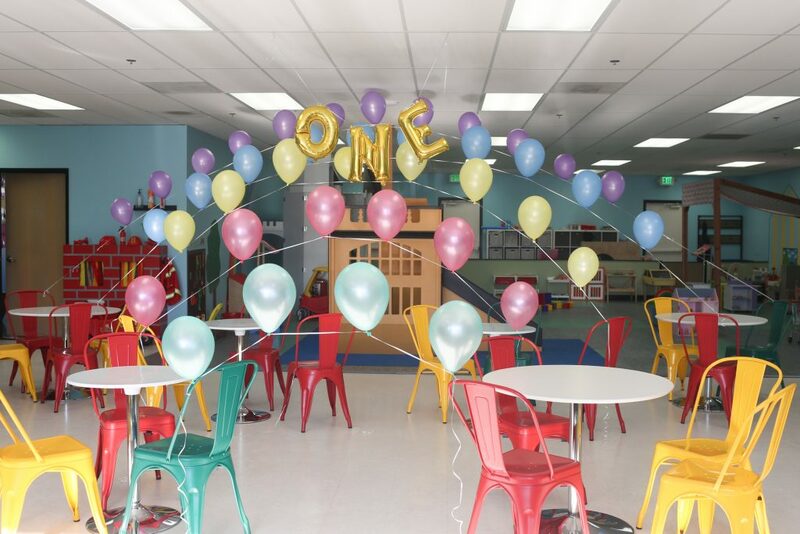 Dinosaur Birthday Parties are roaring over here at Imagine Play. 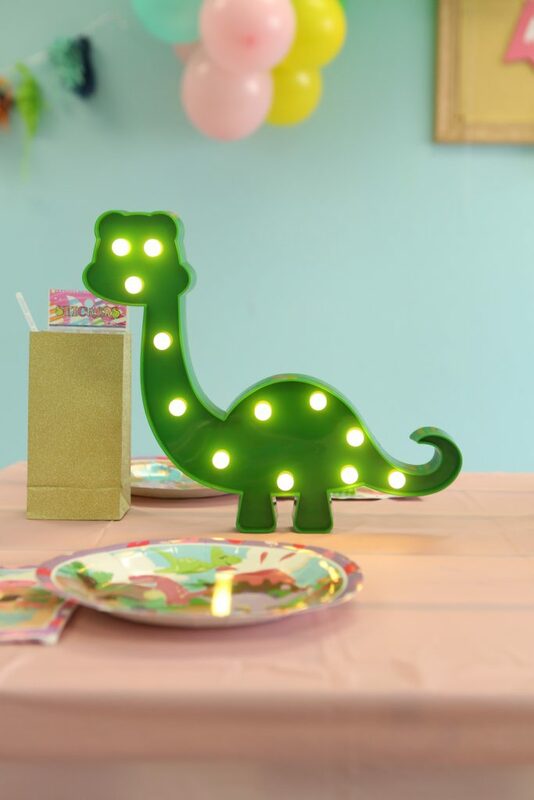 We especially love this one because it has a tutu theme, proving that all kids can love a dinosaur birthday party. The pink and green color scheme was fun to coordinate. We loved how well it turned out. 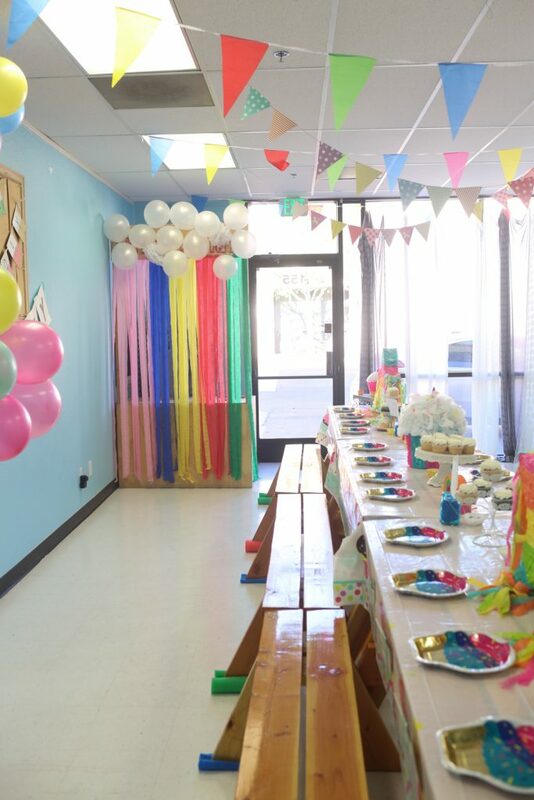 No themed party is complete without our beloved balloon arches. 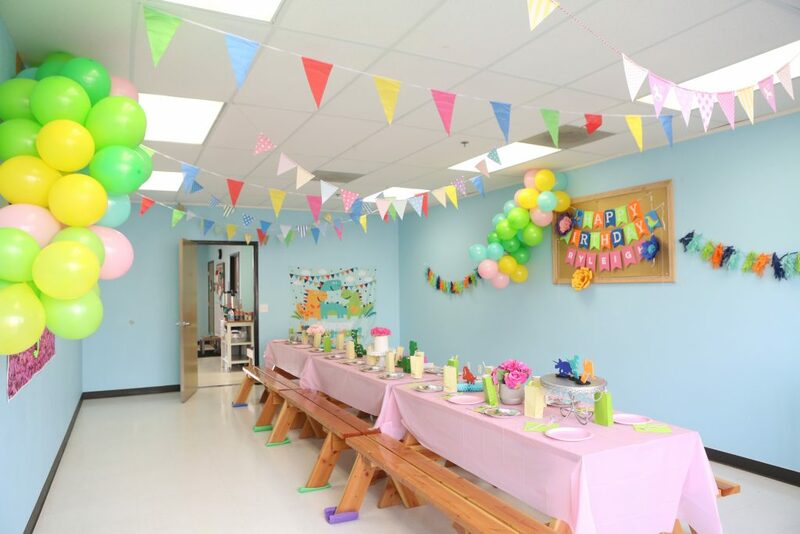 This party’s arch had pink, green, teal and yellow balloons. The table decoration included felt dinosaurs and flowers. Each seat got a dinosaur place setting and goodie bag. 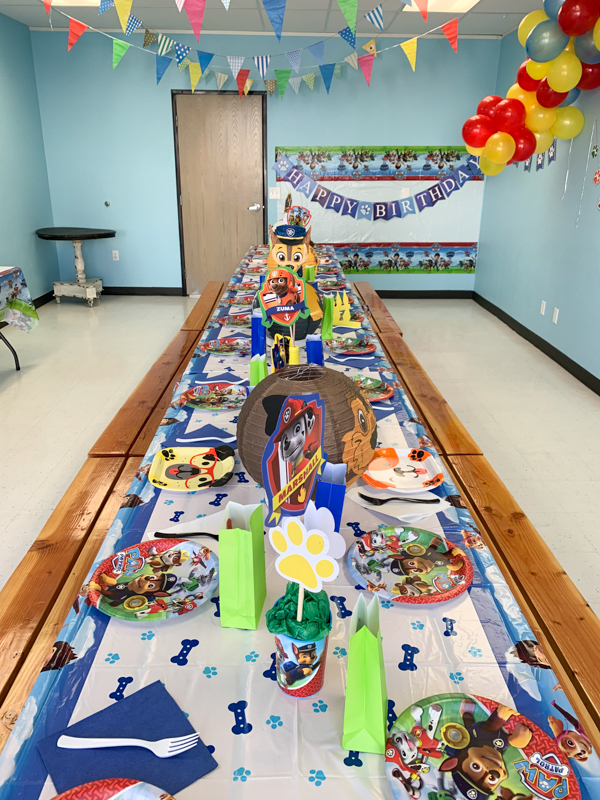 We alternated between themed plates and solid color plates to pull in more coordinating colors and added some cake stands to give vary height levels to the decorations. 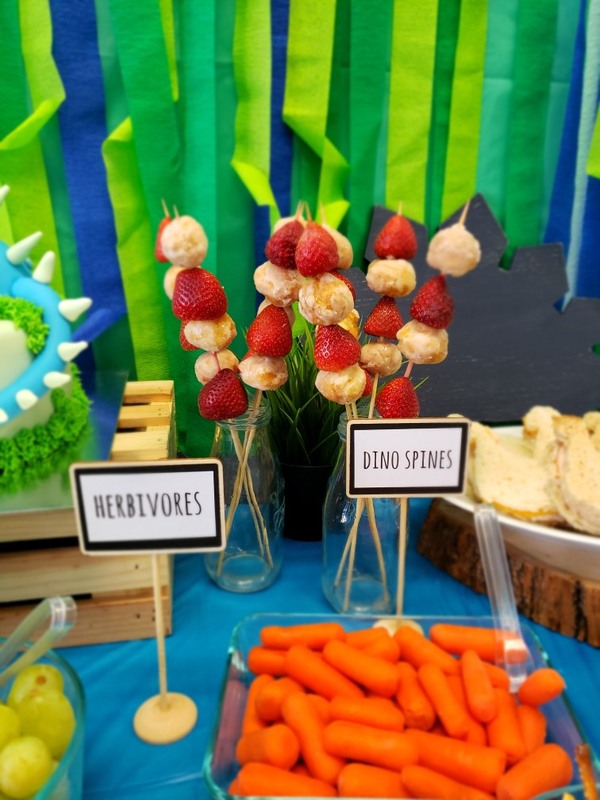 Our favorite item from the table decor was these dinosaur marquees. They are so cute! 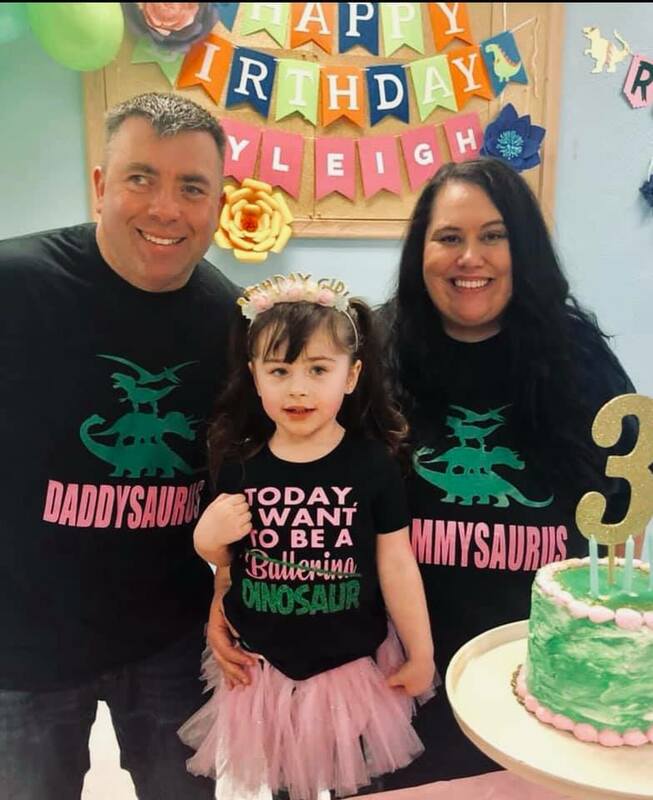 Thanks to this cute Dino family for sharing their special day with us! 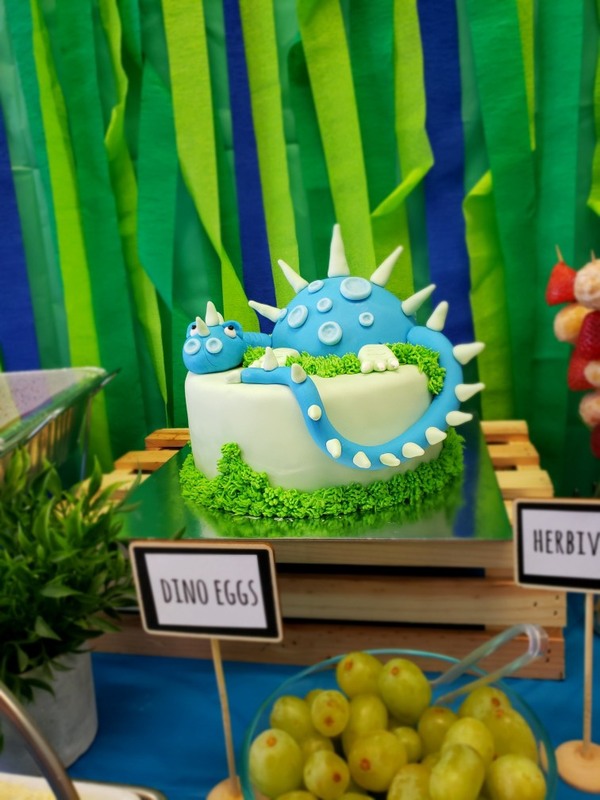 Here are some other cute ideas from for your dino party. 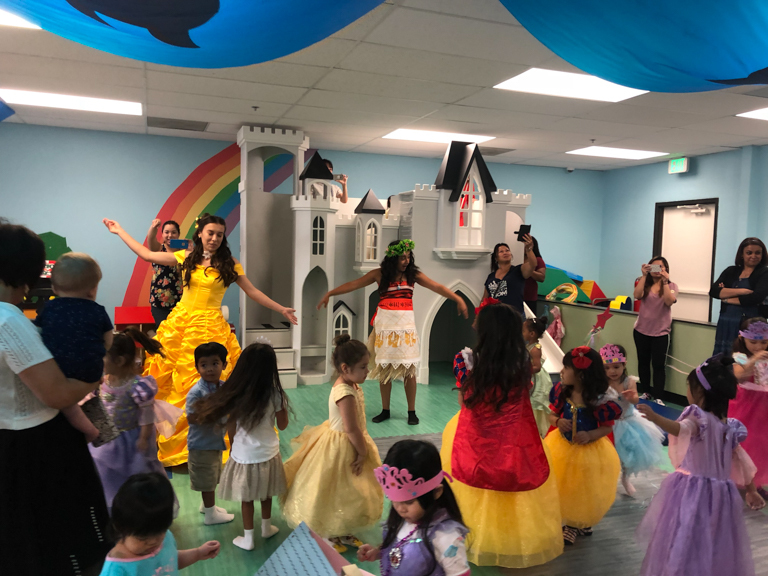 Imagine Play has done many character appearances in our play area and you can get one included in your birthday party package. 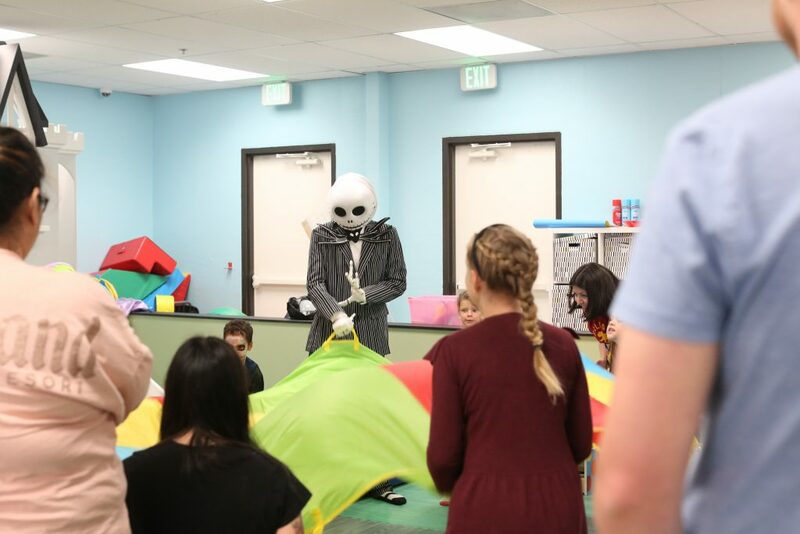 The kids love seeing their favorite character at their birthday party. You can get ice princess, hawaiian princess, belle, catboy and more. 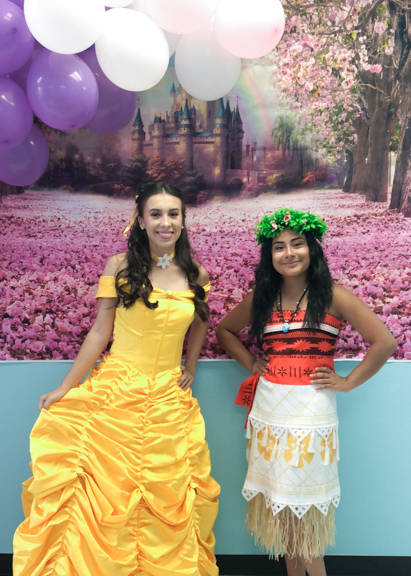 If you are interested in booking a character, here’s what to expect during your party time. The kids love hearing a story from the characters. We like doing interactive story time. They like to get the kids engaged by telling them a story and asking them questions to perk their interests. Usually, they help the kids do a sing-a-long with some of their favorite songs. We love it when the kids hold hands and really get involved with the sing-a-long. All the characters have different backgrounds and talents. Some of them like to teach a dance. While others, do a snow trick. Sometimes, they play a game such as freeze dance or parachute. And then of course, we take lots of pictures. About this time the party is pretty hungry, so while we wait to sing to the birthday child, the characters do a filler activity with the kids. 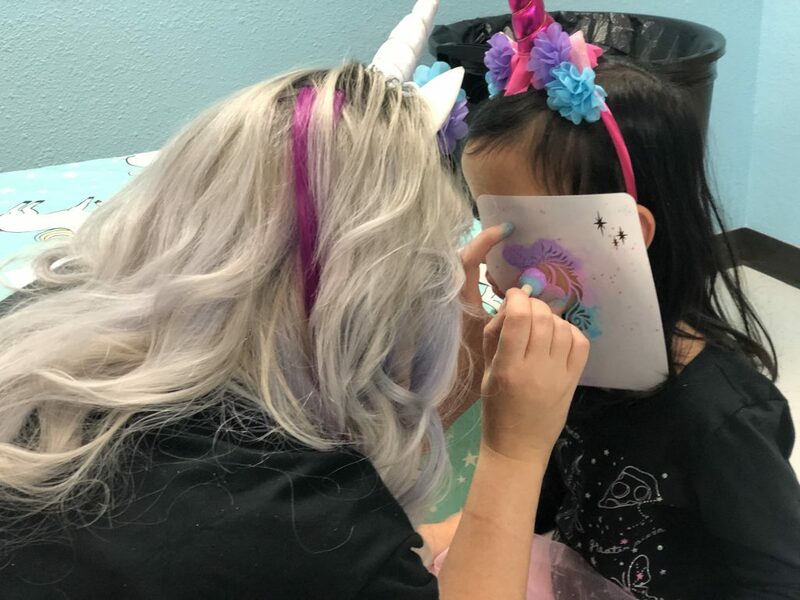 It can be face painting, tattoos or a small craft. The character usually stays to sing happy birthday and to finish up any last minute pictures with the guest of honor. 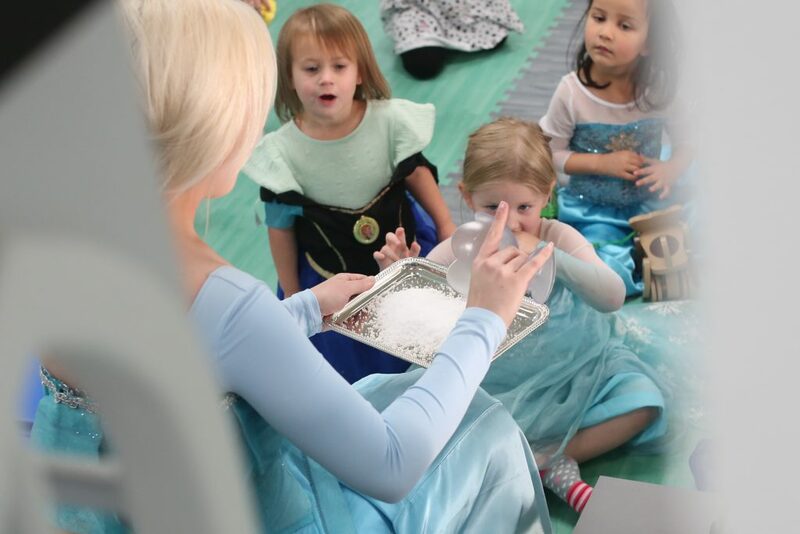 You can see more of our party packages on our website or email us for more details. Check out this video of our ice princess in action. 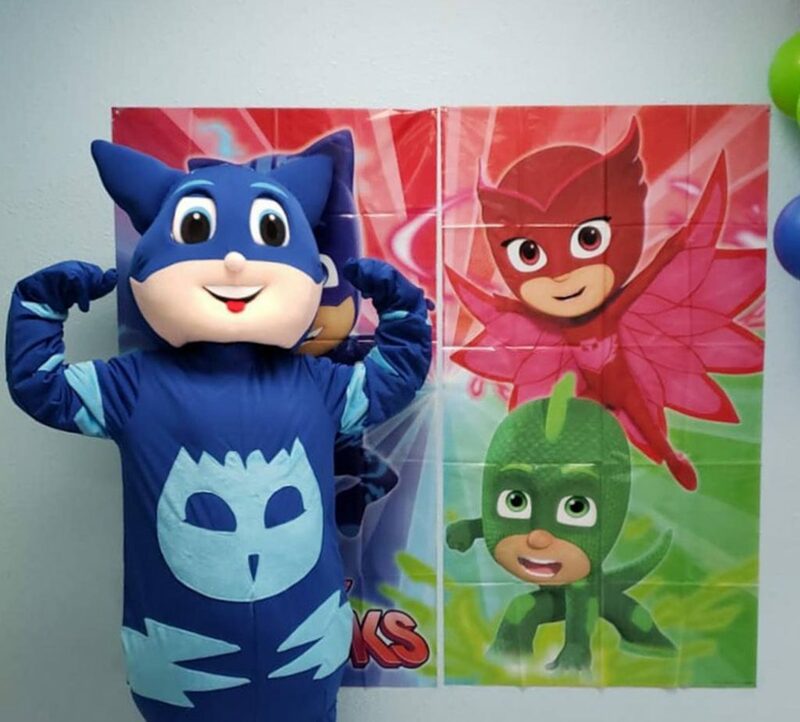 Does your kids love Catboy, Owlette and Gecko? 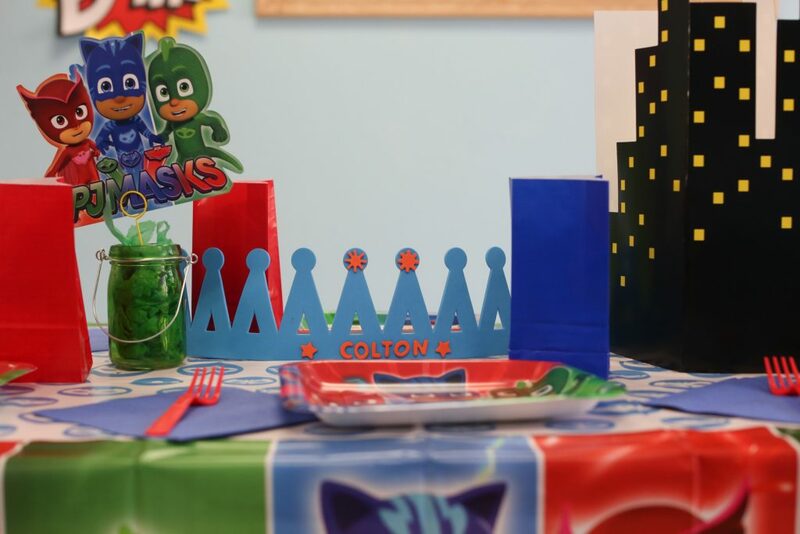 Well, they will love this PJ Mask Birthday Party! 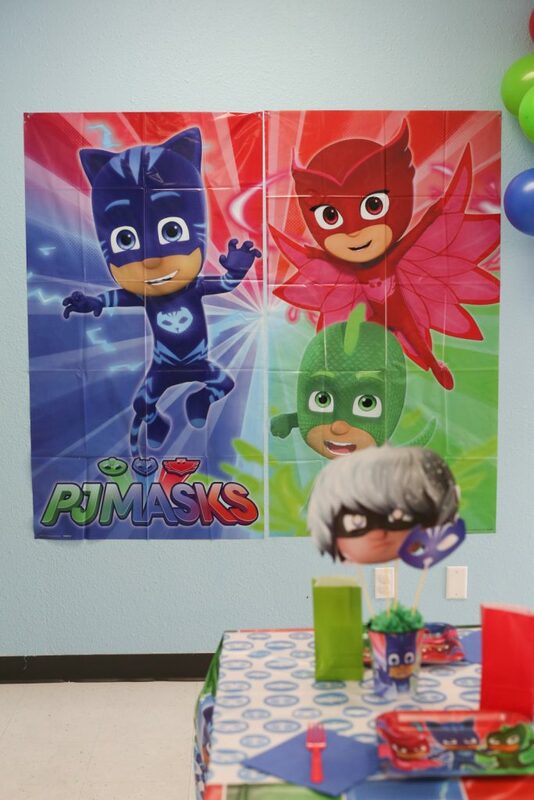 PJ Masks are the newest disney superheroes, therefore we used some of our superhero themed birthday tricks like our cute superhero backdrops. 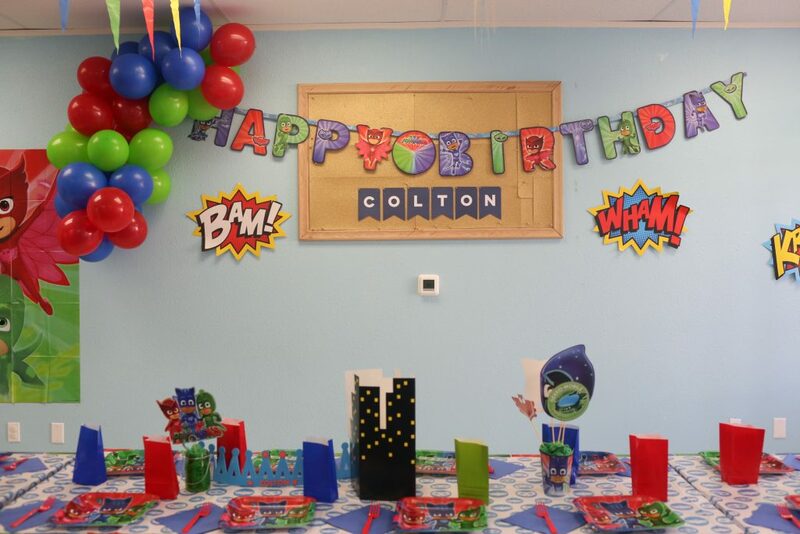 We added some PJ Mask flare with balloon arches in the colors of blue, green and red and included pj mask wall decor. 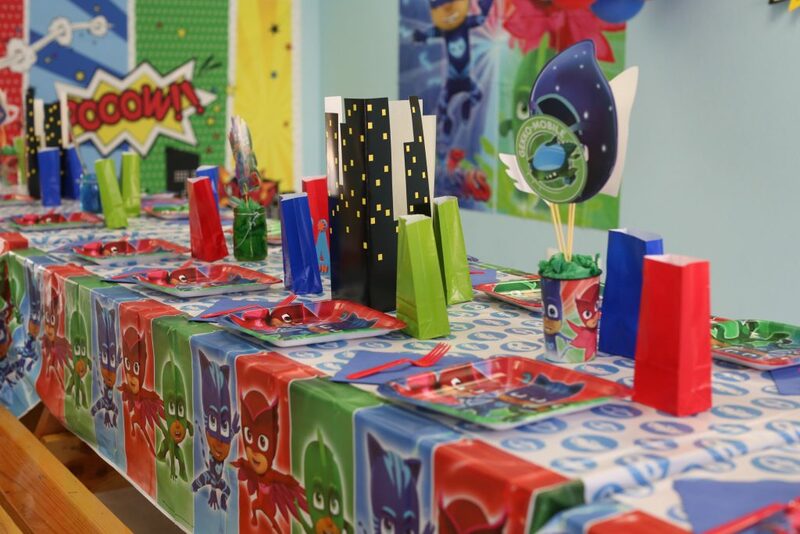 The tables got a spread of PJ Mask table coverings and with themed plates, goodie bags and more. 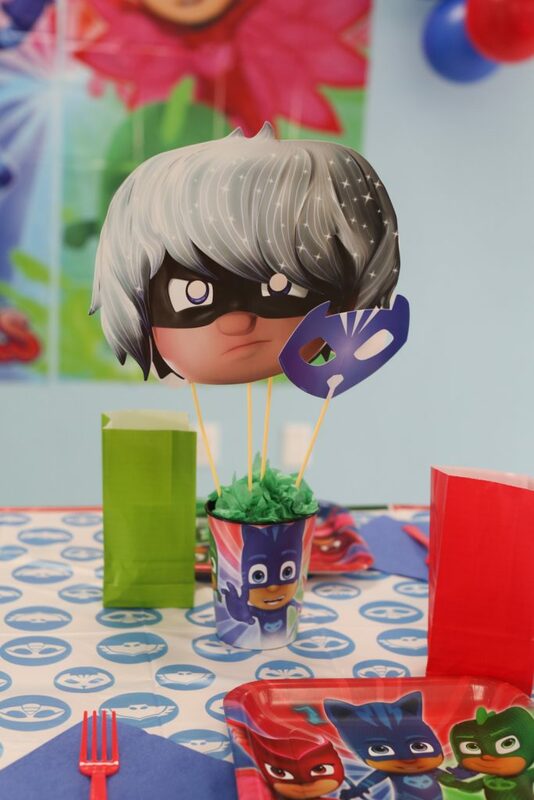 We also included some PJ Mask table decor. Of course, our guest of honor got a customized crown too. This particular party got a visit from Catboy. 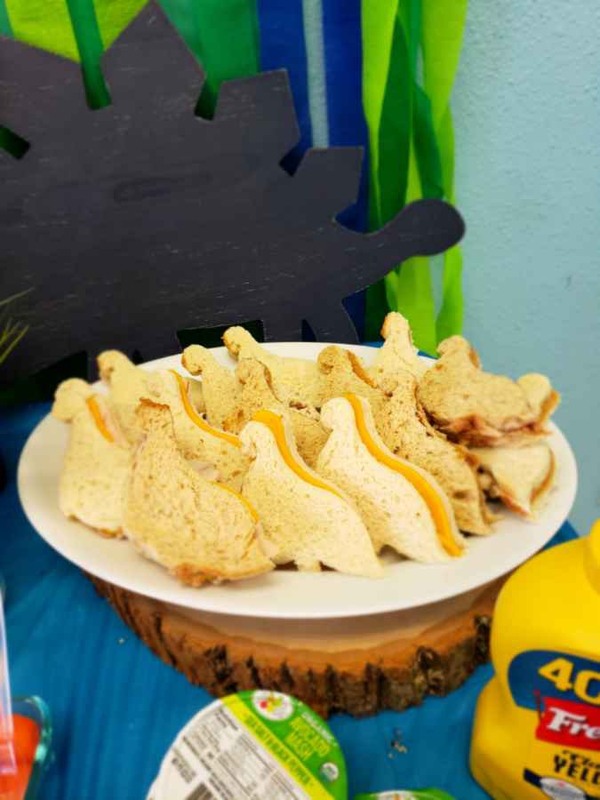 Check out other themed parties on our blog. 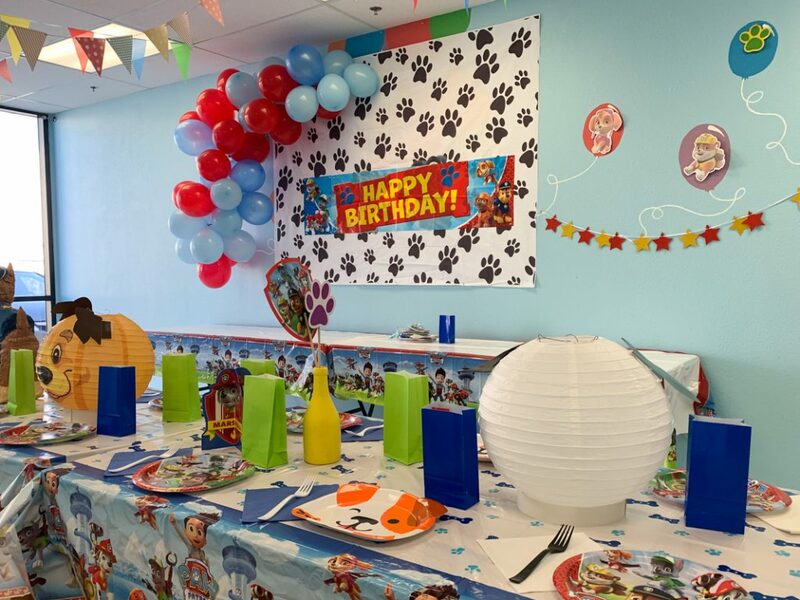 You can see our birthday party packages on our website. 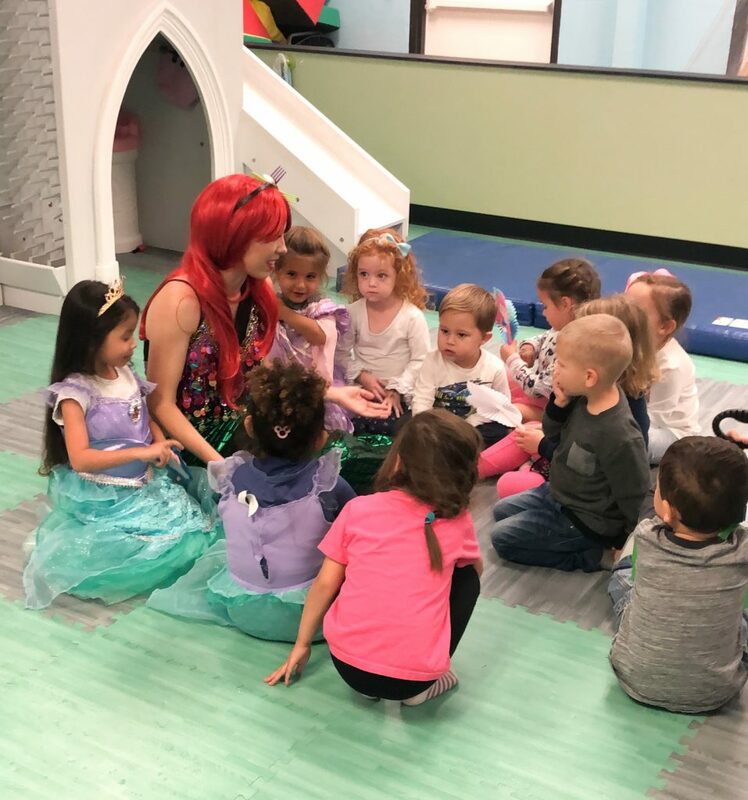 We had an undersea adventure at Imagine Play with this Mermaid Kids Birthday Party! 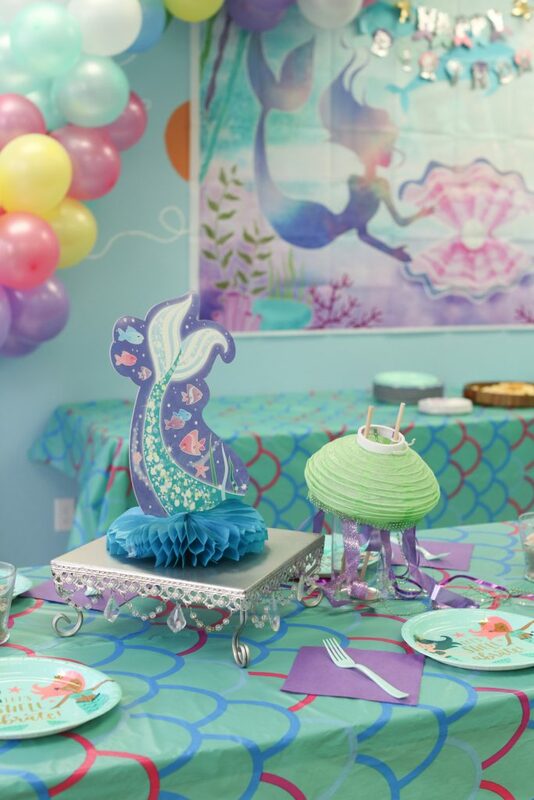 It was mer-mazing and we love the color scheme of aqua, purple and all things mermaid! Of course we started with our beloved staples, our backdrops and balloon arches! We opted for mostly pastel colors for this party. 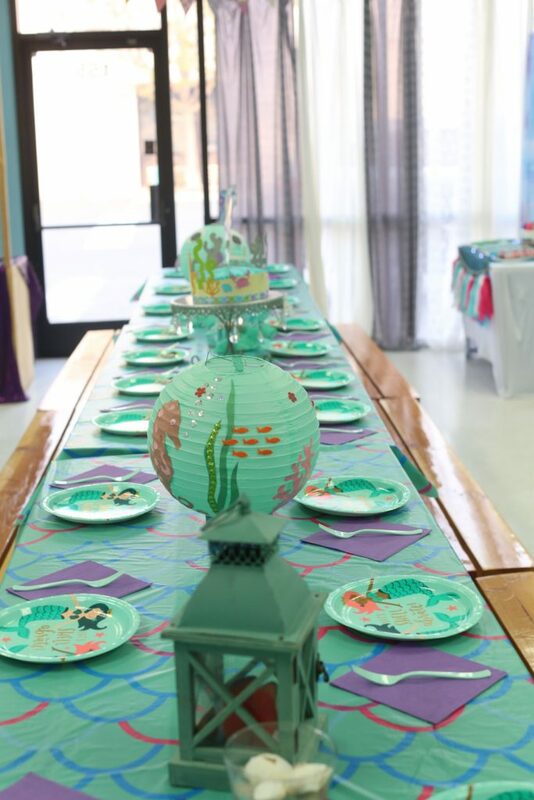 The table decor included Mermaid plates and some fun items such as paper lanterns decorated in undersea creatures. The table also got several jars of seashells. 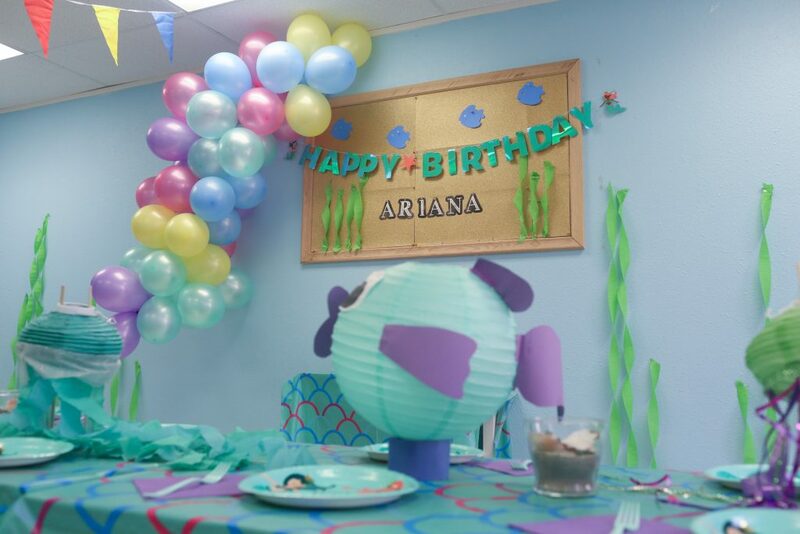 Other areas includes some fun mermaid details with jelly fish lanterns. The walls and our name board got a helping of seaweed made of streamers. 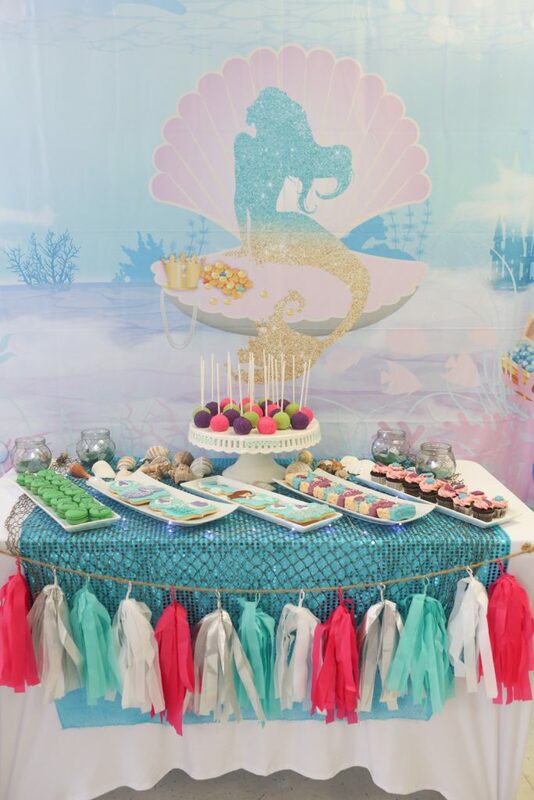 The parents opted for this beautiful desert table by Paperie By Paula. It had all kinds of sweet treats such as cake pops, rice crispy treats, macarons and more. 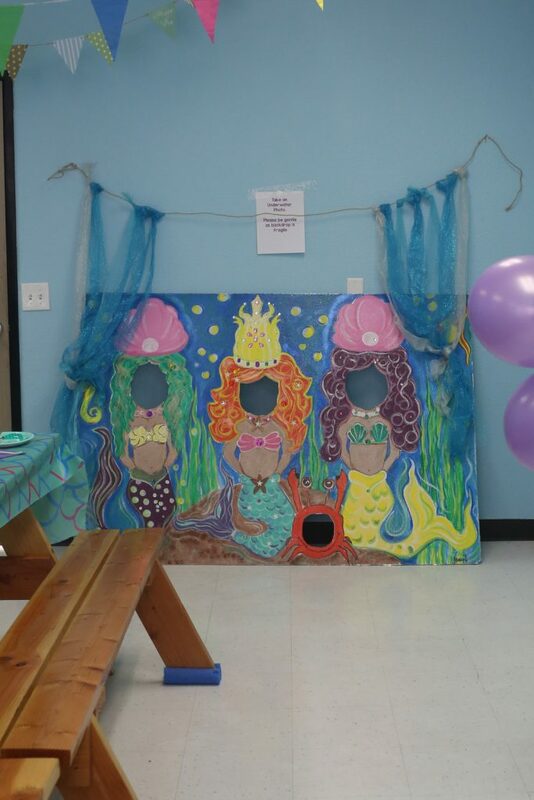 We also included a surprise photo backdrop so the kids can be mermaids! This was our favorite little detail. 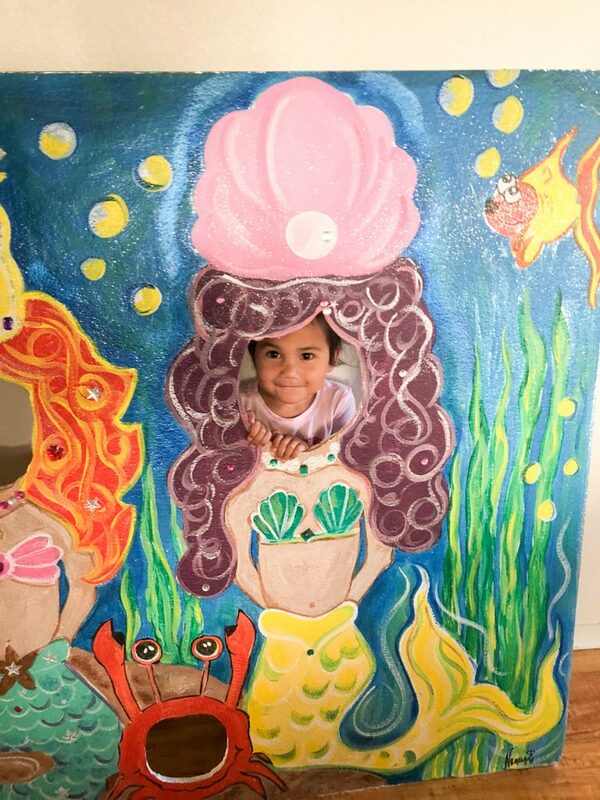 Our mermaid princess came to visit too. She gave the kids mermaid tattoos, told them a story, did a sing-a-long and played a game with them. This was one of the cutest themed parties. 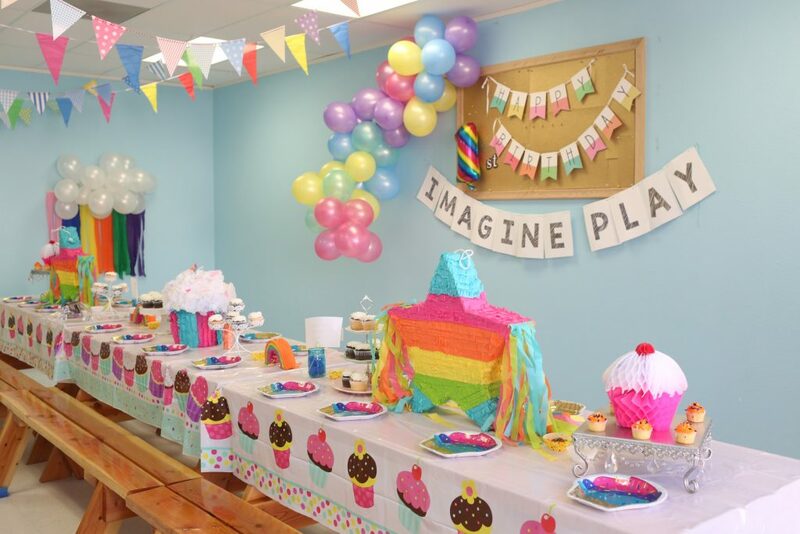 You can check out all our other themed parties here on our blog. We celebrated turning one this weekend. 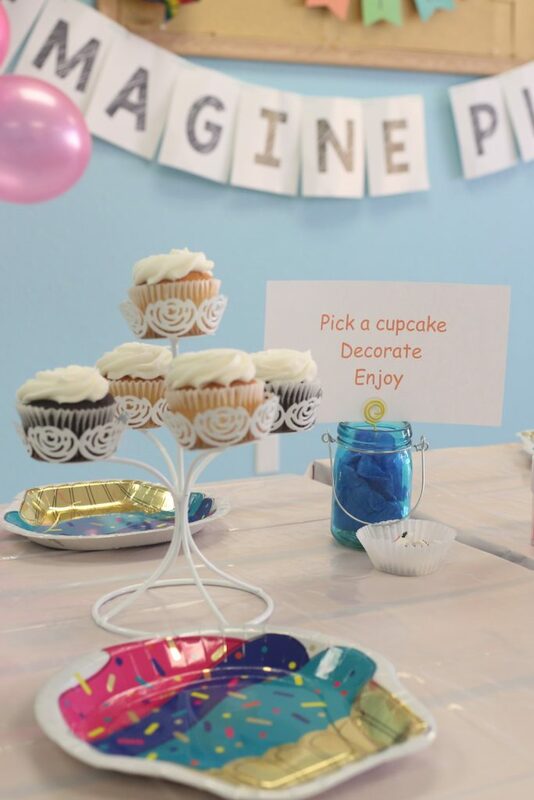 We love this super cute 1st birthday party idea we can up with for Imagine Play. 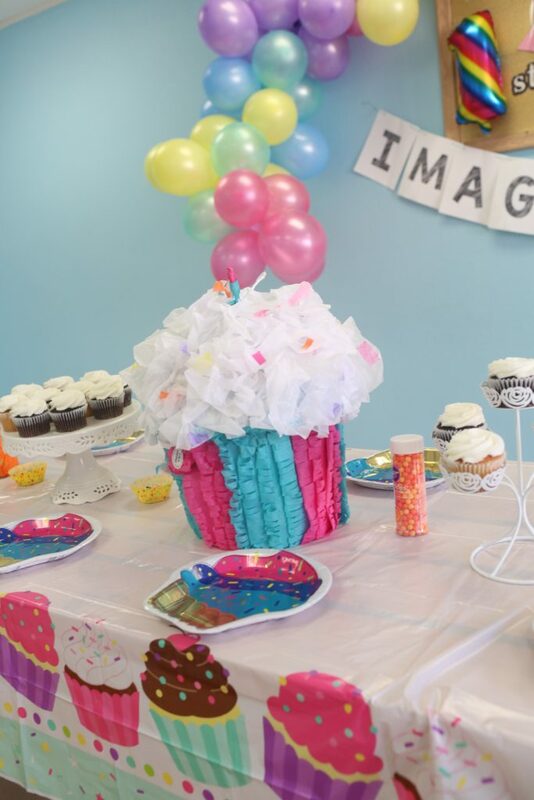 It’s just a cupcake rainbow theme, but it’s perfect for any child turning any age. 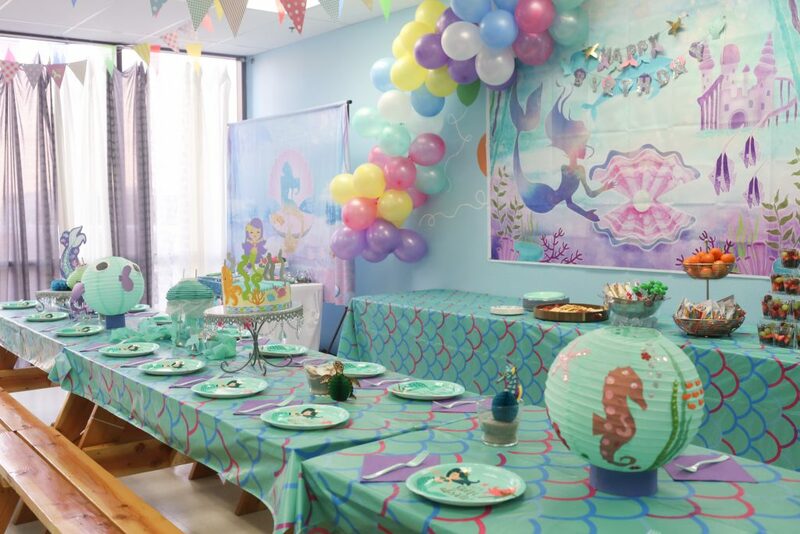 It’s colorful + magical = an awesome kids birthday. This rainbow balloon arch turned out way cute! 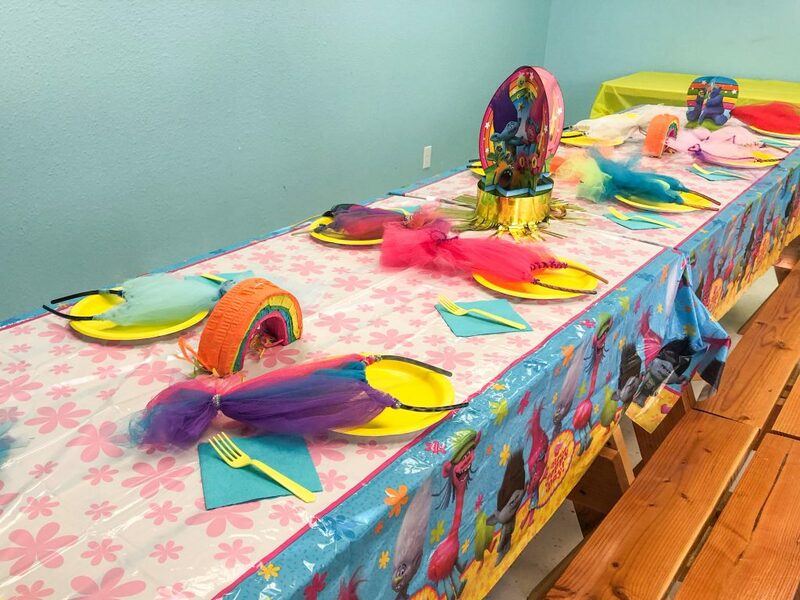 The color scheme for this party was super vibrant. We decided to do a mixture of rainbow colors and not just the traditional. 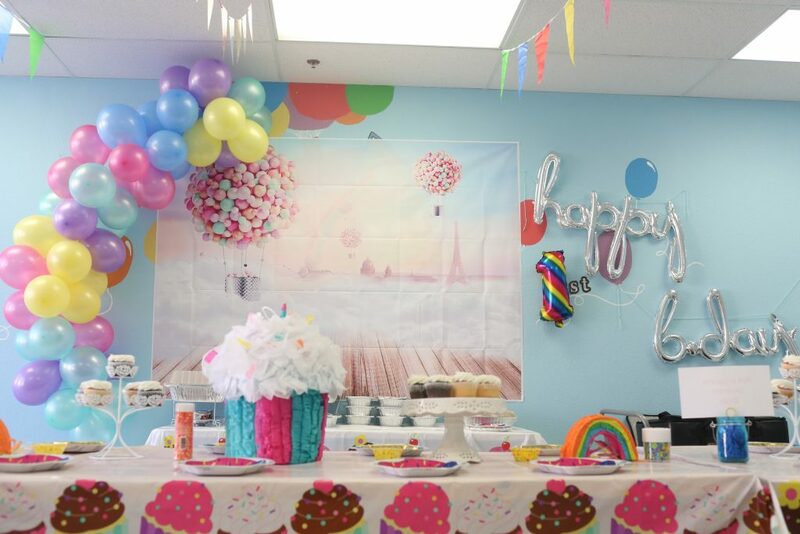 Of course, what would a party be without some balloon arched in pastel metallic colors. Some simple, but fun decor is making rainbow streamers. You can do it as a backdrop or just as wall decor. It looks great in pictures. It gave our lemonade stand new life. The main attraction was cupcakes! We got cupcakes with plain white frosting and laid out sprinkles, m&ms, and icing for the kids to decorate and enjoy. We’re obsessed with all the cute centerpieces for the table! The giant cupcake looks yummy. 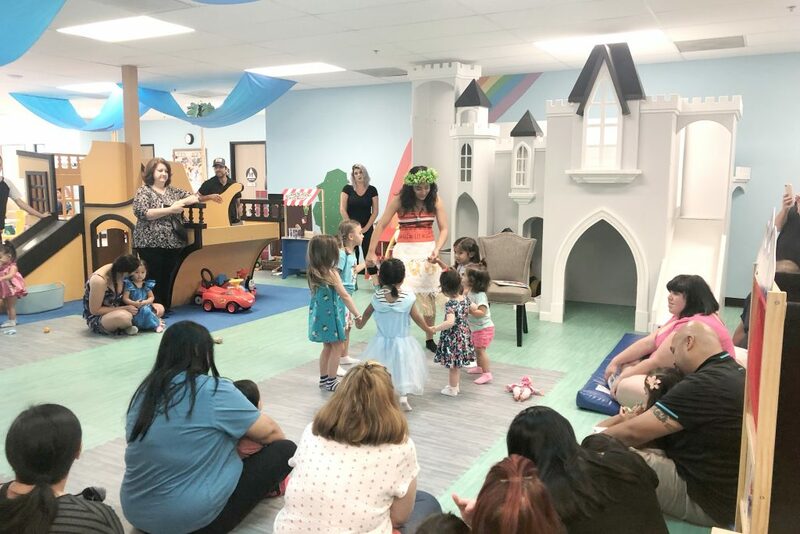 Thanks for all the people that came to celebrate our rainbow cupcake party with us! It was so much fun. 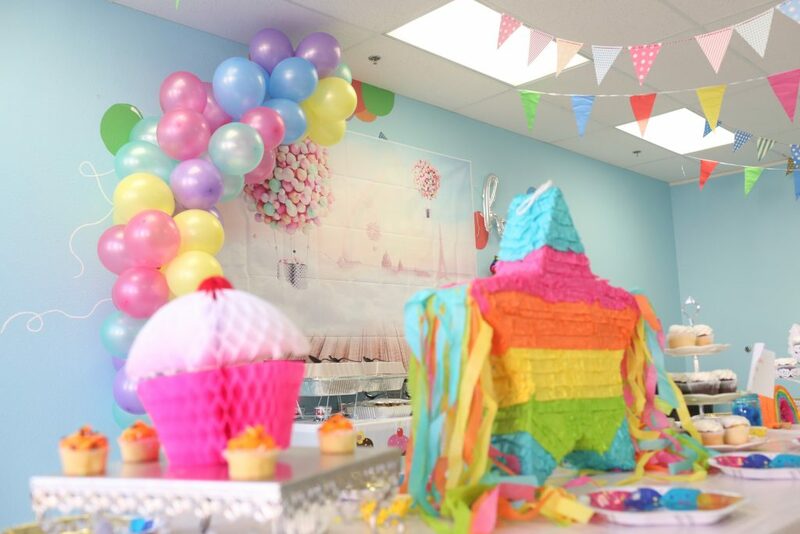 Check out our birthday party packages and let us decorate a themed party for you. 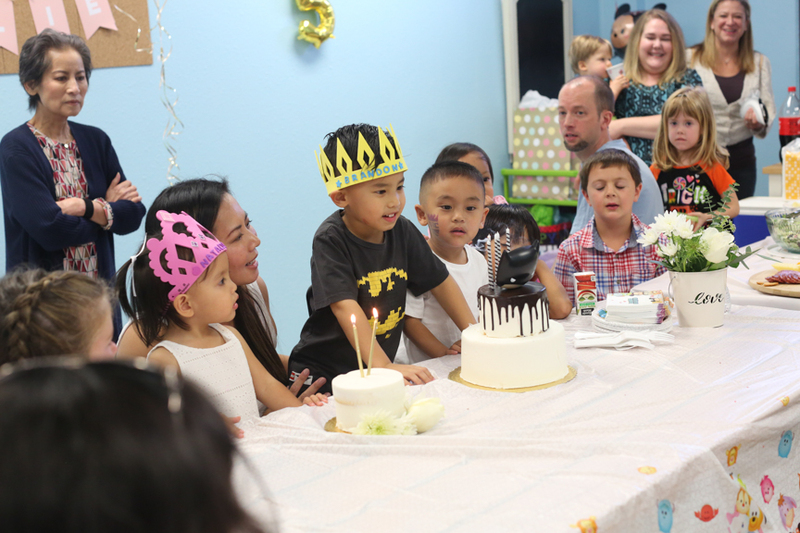 Our semi private parties are perfect for families who want a small gathering. 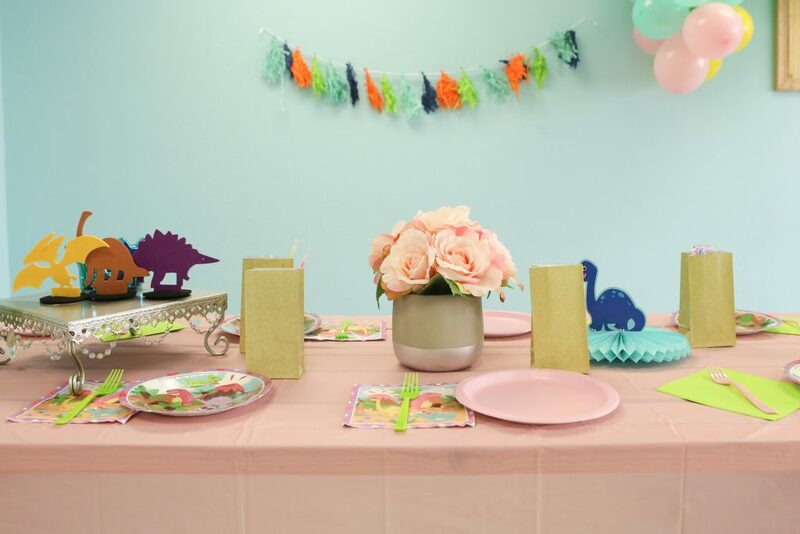 While not all our package include theme decorations you can add on a themed decor package to make the party a bit more festive. 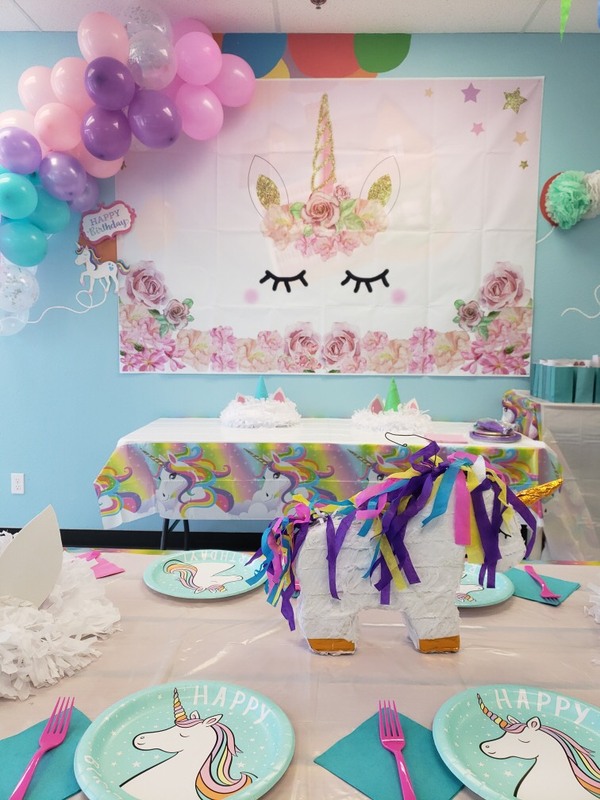 For this Trolls kids birthday party the themed package added some extra fun to their celebrations. 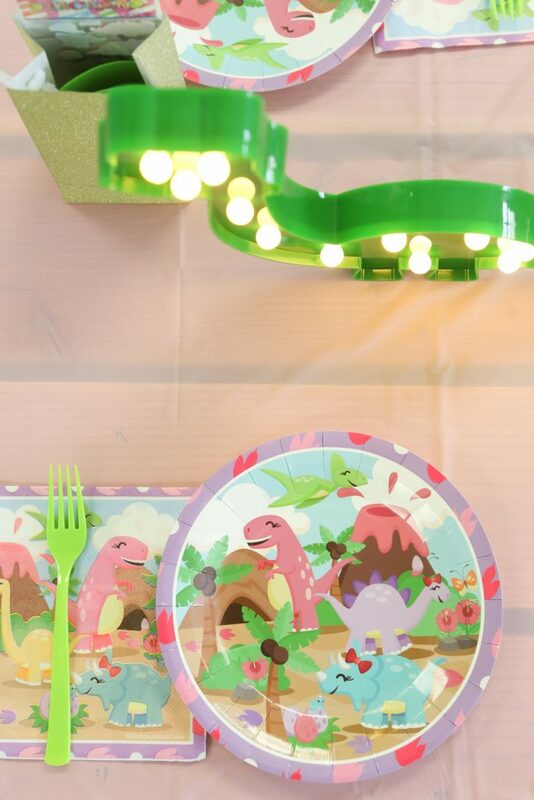 We started with some Trolls table coverings and we love setting the table because it really creates the party mood. 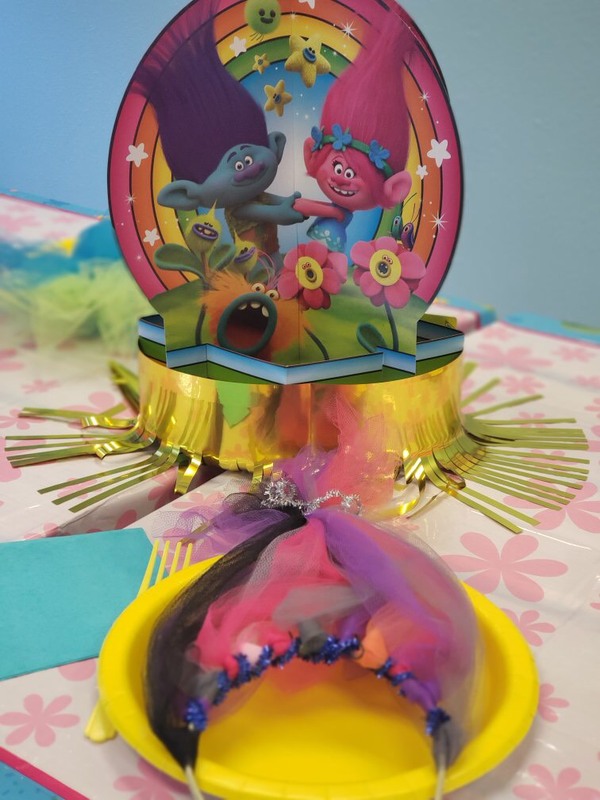 We added some Trolls centerpieces which included some rainbows which we loved. The party also included a themed banner, not pictured. 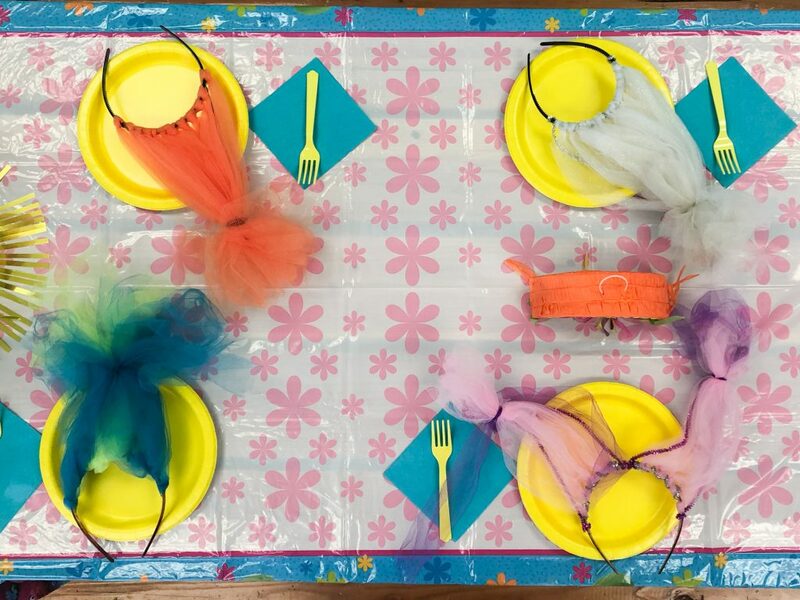 And because we love to surprise our party hosts, we added some cute handmade Trolls headbands. 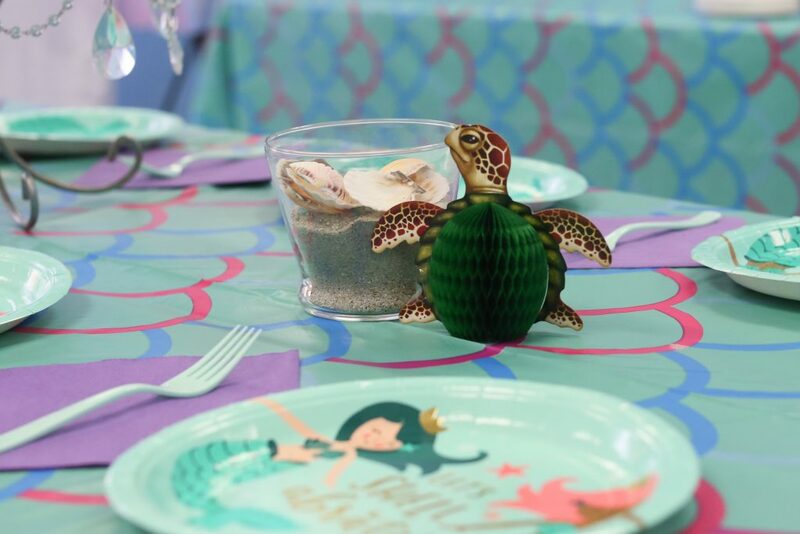 We know the kids loved those and it really completed the table decor. 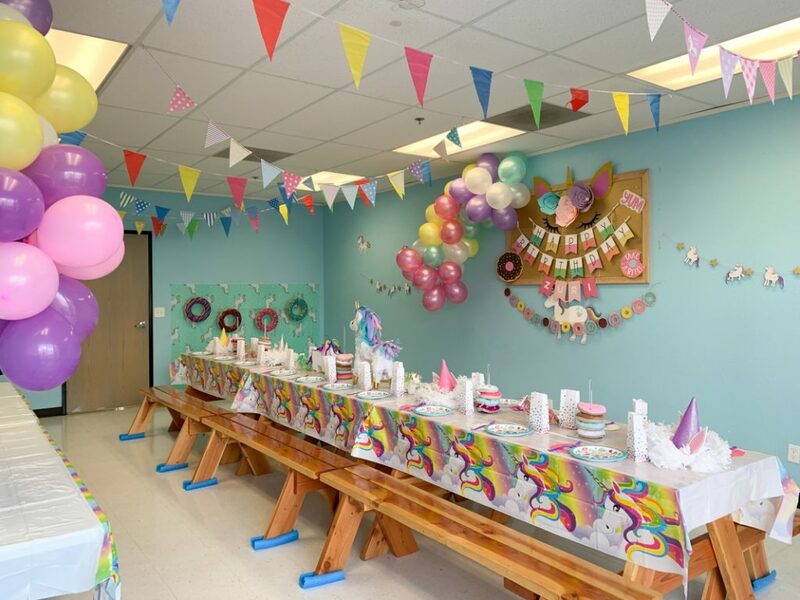 Our party packages are made to fit any budget. 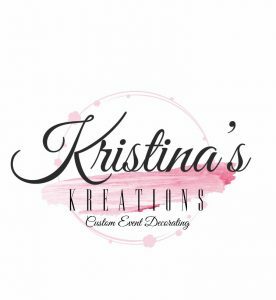 Check them out and see about hosting your next kid’s birthday party with us. 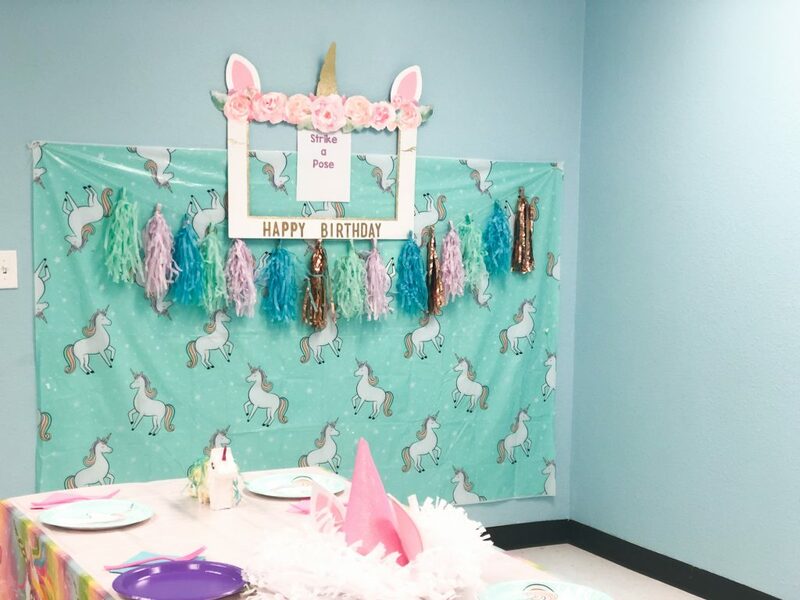 If you are looking for a bit more, in the next room we did a themed unicorn party. It’s still one of our favorite themes to decorate. 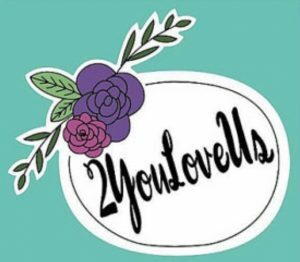 Our theme parties are perfect for hosts that want us to do all the decorating and entertainment. All you have to do is bring food. The most stress-free way to celebrate your child’s birthday. 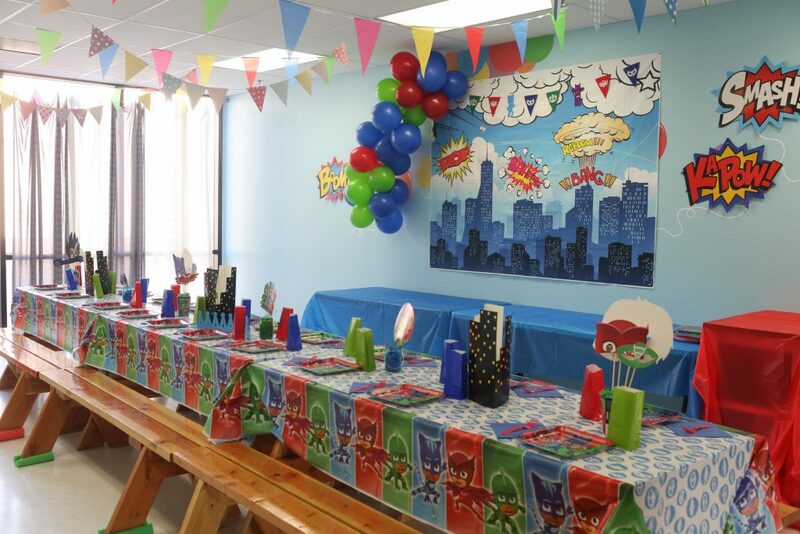 One of the themes we love to decorate at Imagine Play is superhero because of all the colorful decor. 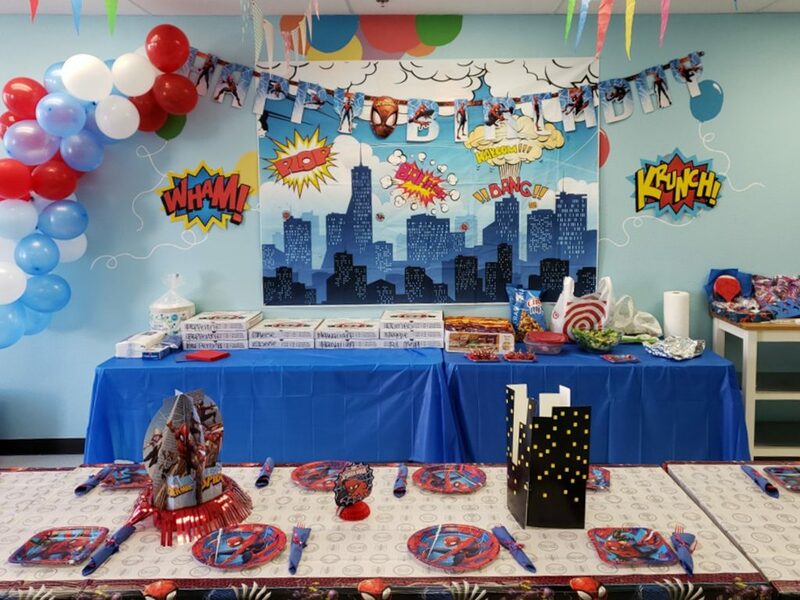 We also like to tweak our superhero theme a bit to fit more of the kid’s favorite characters such as this Spiderman kids birthday party. We used most of our standard decor such as our skyscraper centerpieces . 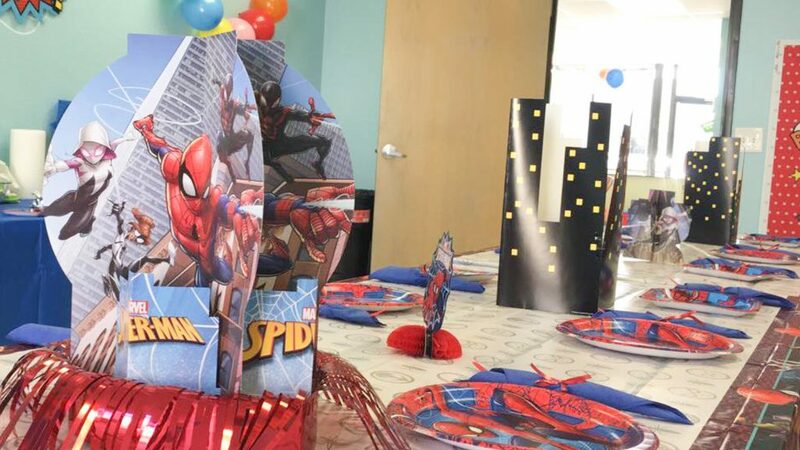 We added a little bit of spider man flare with plates, table coverings, banner and spiderman centerpieces. Of course nothing is complete without some balloon arches. 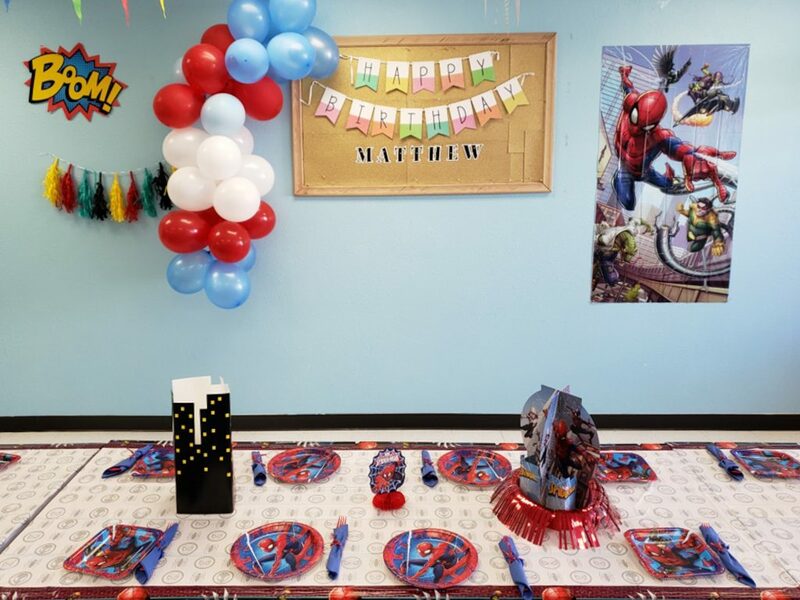 We chose spiderman colors for our beloved arches for this party. One of our favorite things about this theme is those really cool backdrops! It really brings the superhero to life. 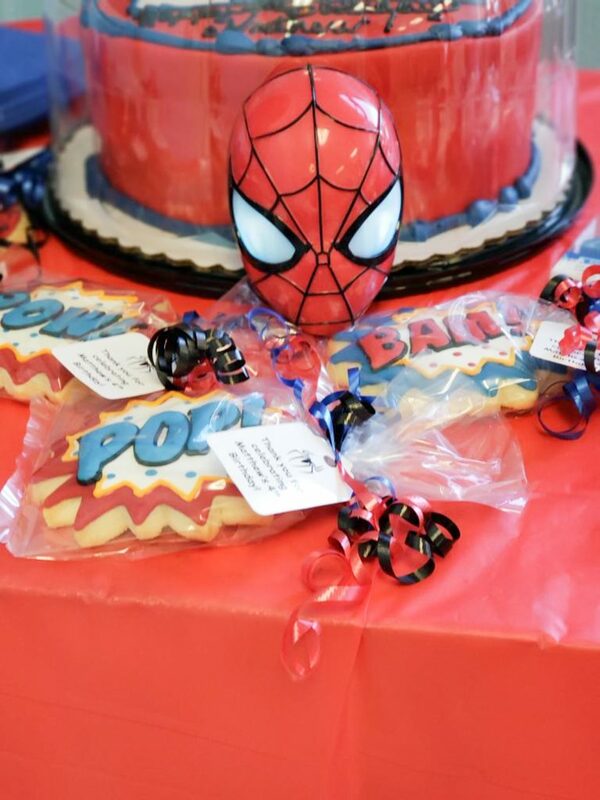 The birthday parents never disappoint with some cool graphic cookies and Spiderman cake.